Keeping up with fashion trends can sometimes be uncomfortable and expensive. But trying a new style or two is typically not life-threatening — except in the case of these dangerous trends, that maimed (and sometimes killed) anyone brave enough to sport them. Today, sugar is so ubiquitous and cheap that avoiding it involves some rather complicated culinary gymnastics. But, in the Elizabethan era, sugar was not only fairly rare, it was also incredibly pricey and only those at the very top of the economic food chain could afford to indulge. Unfortunately, much like sugar had yet to become commonplace, so too had flossing and a rigorous dental cleaning schedule. Predictably, this resulted in teeth with a less than pearly white veneer. Instead of being much bothered by the decline in their smiles, however, the trendy Elizabethans merely declared tooth decay to be so hot right now and continued on their merry way. It even spawned a temporary fad for people who could not afford sugar to fake their own brush (yes, pun intended) with gingivitis by applying a black powder to their teeth. As both sugar and toothaches soon became more common, however, the trend was not a very long-lived one. In the early 1900s, people preferred their shoes to look as shiny as possible. If you were so unlucky as to be stuck with an older pair or a pair of the wrong color, though, you could still fake the look with the help of a little shoe-polish. A particularly popular variety of shoe polish was made with a toxic, but also highly shine-inducing chemical, nitrobenzene. When the polish was completely set and dry, the wearer would notice comparatively few side-effects. Sometimes, though, pressed for time, people would put on their shoes before the polish had completely dried. And then the effects — which could include everything from passing out to turning blue — became painfully obvious. Curiously, the effect of nitrobenzene on the wearer were even more magnified if he or she had consumed alcohol and, on occasion, a seemingly-healthy party-goer showing up to an event with freshly-polished shoes would, after a few drinks, suddenly take ill and occasionally even die. Check out this green dress! Pretty nice, right? Well, in one sense (fashion), yes, definitely. In another (staying alive), not so much. Far before the days of pantone, this bottle-green color was sparking a craze among Victorians the likes of which wouldn't be seen again until the marigold trend. (Seriously, folks, get with me on this.) Besides being undeniably handsome, however, this particular shade of green dye was also undeniably toxic. The key ingredient in getting that bright jewel tone? Arsenic. As unpleasant as it was for the wearers, though, arsenic poisoning was much more of a risk to the garment-dyers. The shade of green was regarded as so festive (not to mention pricey) that it was typically reserved for just the most special-of-special occasion outfits and only worn rarely. The men and women who worked on the cloth and on making the dress itself were exposed much, much more intensely. This was frequently the case, not just with dressmakers, but also notably with hatters, who often suffered slow poisoning from the mercury used in, among other things, giving top hats their notable shine. Garishly-colored and brightly-patterned socks aren't just worn today — men in the 1860s were also quite fond of socks in a rich array of patterned pinks, oranges, reds, violets, and more. Until, that is, some wearers began to be afflicted by a mysterious series of chemical burns on their feet, laid out in precisely the same patterns as those on their socks. Though the burns were severe, sometimes so much so that their sufferers were unable to walk, doctors were mystified as to their cause. Adding to the mystery was that fact that the condition seemed to strike at random. Unlike the arsenic-based green dye or similarly toxic mauve dye made of coal tar, which would pretty much attack whoever wore it without distinction, whatever was causing the injuries was selective. Some people who wore the socks were afflicted by a painful series of burns, while others sporting the exact same footwear for the exact same amount of time, had no problems at all. Eventually, chemists were able to trace the problem to dyes, particularly the new shades of red, used in the socks. But it wasn't just the dyes, it was the alkaline compound used in them and how it reacted to human sweat. While most people's sweat is slightly acidic, a small minority have sweat that is more alkaline. When this alkaline sweat came in contact with the dye, some of the dye would dissolve and burn the skin. Makeup trends come and go, and some of them are more regrettable than others. The trend for heavy, pale foundation makeup in Elizabethan times was one of the most unfortunate. In those days, blending your own makeup was common and the makeup of choice, ceruse, was made by mixing a white lead compound with vinegar. Predictably, this resulted in a slow poisoning. Queen Elizabeth, who helped popularize the trend, may have taken ill and eventually died because of it. Starting in 1917, the U.S. Radium Corporation began employing several young women in a factory to paint the faces of watches with a radium-based paint. Factory protocol called for the women to moisten their radium-laden paintbrushes with their lips to bring them to a point. At the time, radium was not considered dangerous, and the women would also use the paint on their nails to make them glow and even run some of it through their hair. Within a few years, several had died and the surviving ones had such acute poisoning that one woman's hair even glowed in the dark. Tortoiseshell-patterns have been coming in and out of fashion for so long that they're now something of a classic. The methods used to make them, though, have varied wildly. At one point, tortoiseshell hair accessories were made from actual tortoiseshells. But then, in the late 1800s, a new celluloid compound was invented. Originally intended as a substitute for the elephant ivory used in making billiards sets, manufacturers quickly found other uses for it as well, including as part of women's hair combs. The new combs were cheaper and more easily made and quickly became popular. They were also, however, notoriously unstable and easily combustible. Critically, these celluloid combs didn't even need to be directly exposed to a flame in order to combust. Simply being exposed to a heat source was enough to cause them to light up, and they were blamed for causing a number of fires, both in the factories where they were made and in the hands of consumers. The combustion problem wasn't just limited to combs, though. A number of other fashion products made out of the material — ranging from buttons to collars, even the occasional pair of dentures — experienced similar issues. Thanks to Dr. Alison Matthews David for sharing her research and several stories with me from her forthcoming book Fashion Victims: The Dangers of Dress Past and Present, due out September, 2015 for this article. 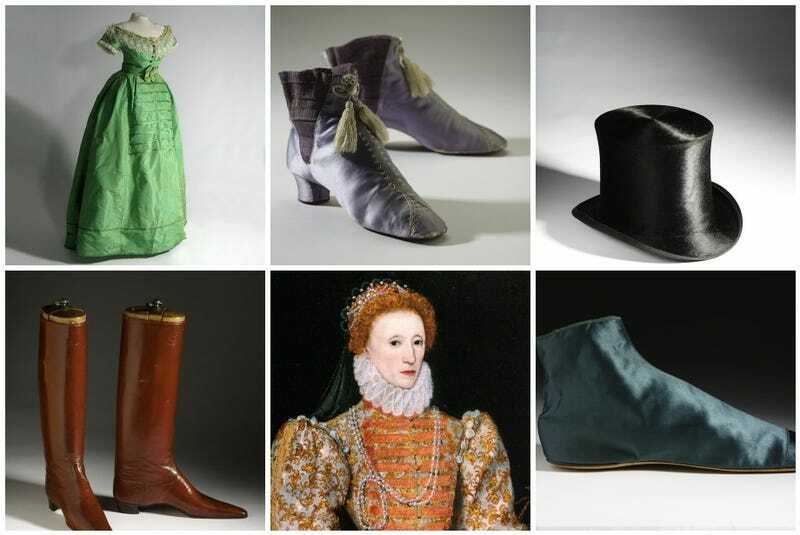 Also, thank you to The BATA Shoe Museum for providing images from their exhibit Fashion Victims: The Pleasures and Perils of Dress in the 19th Century, currently open now.